Rabbi Rami Pavolotzky and Rabbi Daniela Szuster joined Temple Beth El in November 2015. The married couple relocated from San Jose, Costa Rica, where they served as co-rabbis of Congregation B’Nei Israel since 2004. Rabbi Rami became licensed in Physical Sciences in 2001. He was ordained as a Rabbi in 2003 at the Seminario Rabinico Latinoamericano Marshal T. Meyer in Buenos Aires, Argentina. He earned a Master’s Degree in Jewish Studies specializing in Talmud and Halacha (Jewish law) at the Schechter Institute for Jewish Studies in Jerusalem, Israel in 2004. He participated in the Senior Educators Program: The Melton Center for Jewish Education at the Hebrew University of Jerusalem. He collaborated with four other rabbis including Rabbi Szuster, to publish Comentarios de la Parasha 5768 (Torah portion commentaries) with UJCL Press in 2008. Rabbi Daniela earned her Master’s Degree in Jewish Studies from the Schechter Institute of Jewish Studies in Jerusalem. She received her rabbinical ordination from Seminario Rabinico Latinoamericano Marshal T. Meyer in Buenos Aires, Argentina in 2003. She was licensed in Psychology following her graduation from Universidad de Buenes Aires, and she graduated from Machon Shiluv in Jerusalem where she studied Family Psychology. She earned a Masters degree in Women’s Studies at the Universidad de Costa Rica in 2013. In 2015, the two rabbis published two books together – “Shiron B’Nei Israel,” a songbook with almost 100 Hebrew songs, which was transliterated and translated into both Spanish and English, and “Ten Years of Torah at B’Nei Israel,” a compilation of their sermons, commentaries and articles. 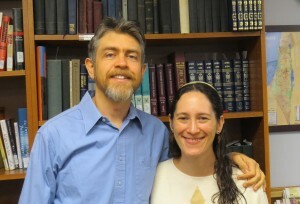 Rabbis Pavolotzky and Szuster were the first full-time rabbis to serve their small congregation in Costa Rica. Together, they launched a number of programs during their tenure at Congregation B’Nei Israel and increased membership by more than 50 percent. They revitalized religious services by introducing new melodies and encouraging member participation. They also launched a comprehensive program of reading in Hebrew, allowing more members to follow prayers in this language. The couple created and headed projects for youth ages 13 to 18. They created a youth group and winter camp, and organized youth-led congregational activities. They also developed a new curriculum for the religious school to enhance the quality of Hebrew and Judaic learning. The school met twice a week, with Rami teaching students ages eight and older, and Daniela instructing the younger students. Before they arrived in Costa Rica, the congregation had provided a newsletter on upcoming temple programs for members. The co-rabbis developed this into a magazine called “Koleinu” (meaning “Our Voice”), which they published several times a year. Rabbi Szuster helped revitalize the temple’s Sisterhood Group by creating a new program with monthly meetings relating to Judaism and women’s issues. As a result, Sisterhood members became more active in the congregation and assumed leadership positions as well. The rabbis also introduced an annual “Shabbat on the Beach” program, an innovative project to allow members to appreciate Judaism in a different more relaxed way. They also helped established the Costa Rican chapter of “Religions for Peace,” part of an international organization. Here, area religious leaders met regularly and discussed ways to improve dialogue and relationships among the various community religious groups. As Rabbis at Temple Beth El, their primary goal is to maintain the congregation’s focus on welcoming individuals and families, both Jewish and inter-faith. They want to invite people of diverse backgrounds and religious practices to participate in the religious, educational and social life at Temple Beth El. They will continue to strive to meet the needs of congregants who vary with regard to knowledge, practice and commitment, and to individuals at all stages of life.